Cthulhu Saves the World from the team at Zeboyd Games is a unique and surprisingly reverent homage to both Lovecraftian lore and the early Final Fantasy design. It is equal parts parody and tribute, and it is absolutely masterful. The game stars the legendary Cthulhu - an ancient cosmic humanoid deity, inspired by the bowels of H.P. Lovecraft's nightmares, with the wings of a dragon, a beard of tentacles, and, apparently, the heart of a hero. The game opens with Cthulhu, harbinger of the apocalypse, rising from the ancient oceanic city of R'lyeh with the intention of destroying the world. However, a mysterious wizard appears, stripping Cthulhu of his powers. The only way for Lovecraft's infamous creature to regain his abilities in order to destroy the world is to - wait for it - save the world, and become a true hero. We accompany Cthulhu on a pixelated 2D journey of redemption, romance, and hilarity through dungeons, combat, and relationships on his quest to save the very world he hopes to one day destroy. A man(ish) on a mission, with a posse of groupies and a song in his heart (probably). Cthulhu has a surprising amount of character development in the game, more than I would have expected. On his quest to save the world, he gradually begins to believe in his role as a hero, and we see Cthulhu trying to reconcile this new role with his former one as the ultimate apocalyptic henchmen of destruction. I didn't expect to relate to an octopus dragon deity monster guy on any sort of level, but dammit, I did. I really do love antiheroes. Cthulhu Saves the World is not only delightfully amusing, but is also intricately woven with Lovecraftian references. Despite this fact, the game is welcoming even if you play without the understanding of why Cthulhu using 'fhtagn' as a curse word is funny. The titular hero spends a significant amount of time insulting his party members and regularly expresses dissatisfaction for having to be a hero, looking to do the bare minimum in order to reach the required level of heroism to regain his powers. Cthulhu is sarcastic, narcissistic, and utterly captivating, particularly when striking down the fourth wall in order to spat with the game's omnipresent narrator. I had decided early on that I was going to love this ridiculous masterpiece, regardless of whether or not the actual gameplay was any good. Luckily it was, so this is a game I can recommend without feeling guilty for doing so. 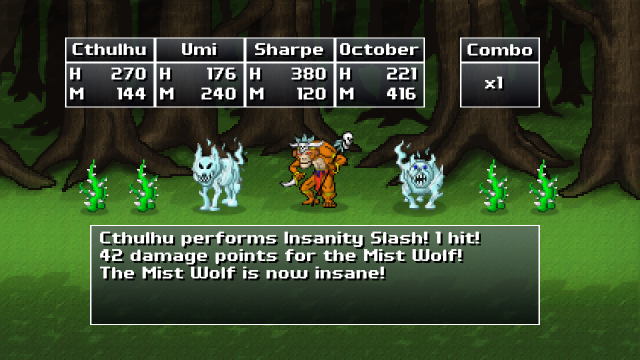 The game has a traditional turn-based combat, but with Cthulhu. 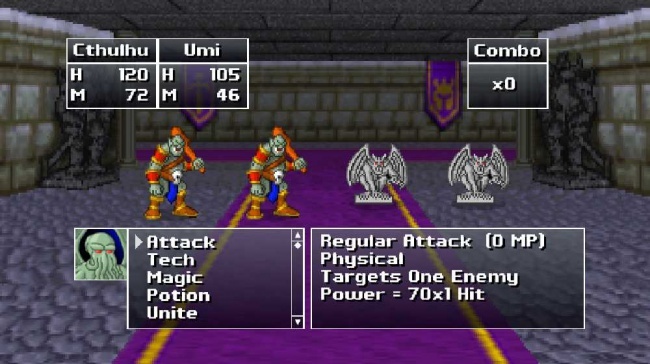 The battle system itself feels very quick and includes many different attack mechanics, but without any drawn out, awkward narrative mixed in. You can buy armor and weapons, restore yourself by staying at inns, learn new abilities as you level up, and have neat mini-conversations with NPCs as you navigate. Basically everything you would expect from a classically designed JRPG, but better, because you can save anywhere, and all party members are revived post-combat. The standard conventions of the RPG genre were as prone to mockery as Lovecraft's lore, which is acceptable considering how enjoyable the game is. The humor is a driving force in the game, offering a deeper incentive to continue advancing than "level up, learn more attacks, and find new items." The personality of the game shines through in every piece of dialogue and interaction. Zeboyd Games managed to create a game that is not only a brilliant parody, it is also a richly created world that draws just as much strength from its mechanics as it does from its inspiration. 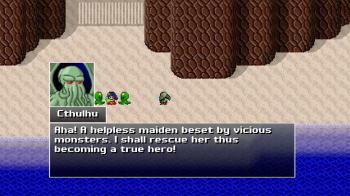 Cthulhu Saves the World is an unexpectedly entertaining and well-made RPG at its core, wrapped in a layer of satire that makes for an enthralling and charming experience. The style of the game is modeled after adventure titles of years past, when a game still allowed players to use their imaginations to fill in the setting. This isn't an RPG with Cthulhu plopped in the middle, but rather one built just as much around his character as the character was built around the genre. In short, the words of Cthulhu himself can best describe my feelings on the game. "I just like insane things. Is that a problem?"